Our first autumn rain arrived today and it´s been a good kind of rain. I took the above photoraph this morning from the Mirador overlooking the village of Cómpeta, which shows a different kind of scene than the last time you saw it. Often, at this time of year, after a hot summer, our first rains come in the form of huge thunderstorms and we are deluged with so much water that most of it runs off the parched earth without doing much good. Yesterday we had grey skies, and this morning we were first of all treated to gentle rain which gradually became harder as the morning progressed. It´s stopped raining now, which is good because there is opportunity for the water to be absorbed into the earth before the next rainfall. I only wrote about the water level in Lake Viñuela last week, and whilst there wont have been much difference made this morning, we are expecting heavy rainfall over the next couple of days. Not only did we enjoy the rain, but this little chap had a great time too. He´s a regular visitor and usually hides amongst some plant pots near the house, often digging down into them, dislodging the contents. Click here to see videos and reports of flooding from other parts of Málaga province. This entry was tagged Andalucía, Cómpeta, East of Malaga, Europe, garden, life, Malaga, Spain, weather, white villages. Bookmark the permalink. People are like praying for rain, people in Europe. Us in California, at least here in SoCal, as far as I know, had one rain this year. By the way, the Spain riot pics I saw all over the place was pretty graphic! Yikes! 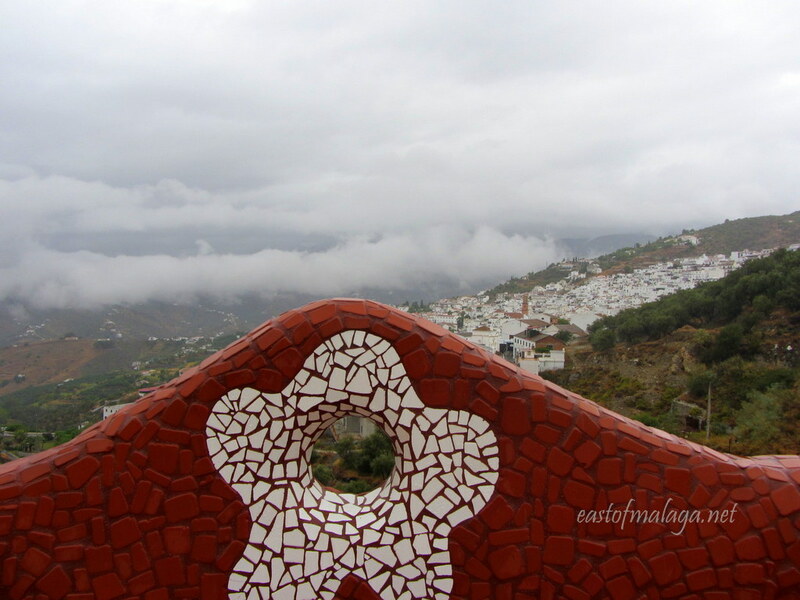 In Spain, the rain doesn´t fall during the summer at all, usually. By the time the autumn rains come, the ground is very hard and dry and often the rainfall runs off as it can´t penetrate the ground – causing flooding. We have spring rain, and I haven’t seen any frogs around. Yours looks really cute. That first pic is amazing. Yes – gentle over the weekend and now back to sunshine for our trip to Toledo – yaay! Love your first shot! You can almost smell the first September rain…. Yes, you can, can´t you? Ooooh I like your friend – he looks pretty big! Your first picture is lovely too, that flowery mosaic on red is so pretty! 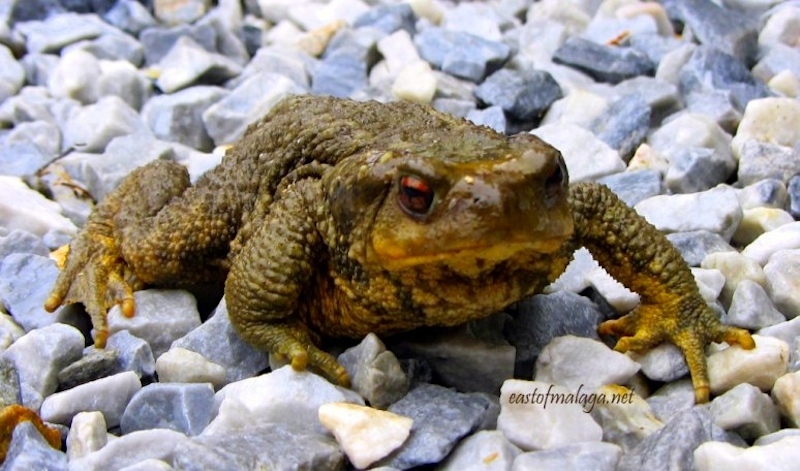 He´s quite big – but as far as toads go, he´s probably pretty average. I did get down on my hands and knees on the gravel, right in front of him, for this shot – so I expect he looks larger than life!! Did you look at the comparison between the rainy shot and the previous shot from the same vantage point I took earlier in the summer? Monte Maroma in the background was completely hidden yesterday with low clouds. It´s raining again as I type this – we are due heavier rain today and tomorrow. Some people are afraid of frogs – you can probably chase them around with that frog – it looks big enough to have extra scary potential, lol. Busy looking for it, thanks. Here’s it’s also raining but not as much as there. Enough thought to prevent me from running this morning – that’s not good! They’ll ADORE you for that! You reckon you can get used to a life of being served by eternally-legged froggies? They can froggie polka for you! There it is! Wow that’s a lot of cloud cover! oh you have no idea how much we need rain like that here! There was some rain on the north of the island, and, I hear, in Gran Canaria yesterday, but nowhere near enough as yet. Just worried about all the topsoil washing away. It’s just dust after so long without rain. Still, we need it badly. That´s the problem with the first rains, isn´t it? Yes, we had good rain yesterday, so that should have helped, but we are due some heavy rain today and tomorrow. We will have to see if the topsoil gets washed away – hope not. Although our climates are so very different, i can see how welcome these first Fall rains must be for your area. Enjoy! I usually enjoy the first rains with some trepidation! I always hope for gentle rain first, which we have had now – it´s when the really heavy rain starts I always worry about landslips because of the mountainous terrain. Great photos! I am ready for fall rains too – maybe this weekend.